What Alice Forgot is a very claustrophobic novel, in that it feels like a tight enclosed space with very little air to breathe. 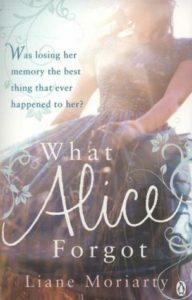 I was never quite sure if I wanted Alice to regain her memory, and thus return to the rather horrible woman we learn she has become from her family and friends but also never really knowing her children and why she became who she became. It is an interesting look at memories and how they shape us, while also being a novel about families and what defines a family. Alice Love falls down during her Friday spin class and hits her head. When she comes to, she has no memory of the last 10 years of her life, meaning that her three children, her best friend, the dissolution of her relationship with her sister, and her marriage troubles are all completely foreign to her. She slowly puts together the pieces of her life and her 29 year old self, who has no memory of the events that led her to this point, is desperate to put her life back into the shape she imagined it would be when she was 29. If I am really honest, the novel feels just a little too neat and clean by the end. Life is messy, and the reasons we end up where we do are going to be foreign to the people we were because they have no memory of how we got here. I think Moriarty was a bit hampered by the requisite HEA. I liked the novel a lot, especially as an examination of memory and how it shapes us, but I didn’t love it. The novel also explores the different ways that women are defined by their families. I think Moriarty was trying to deconstruct the idea that marriage and children are all important to women’s identities but I’m not 100% sure that she was successful. She has two other POV characters, one a woman driven crazy by infertility and another who writes letters to her dead fiancé (and never moved on from his death). There is a line where one women is talking about another who is experiencing infertility issues and she says, “At least she got to be a wife.” This line shows how the idea that being a wife and mother is the highest pinnacle of womanhood has driven these two women to nutty extremes. But we don’t really focus on the women outside of who they are with their families. For example, part of the novel is Alice learning how infertility issues changed her sister to such a state that she no longer recognizes her, but the thing that heals the sister is that she ends up pregnant. My issue is that even though the book shows that the destructive forces of societal expectations about motherhood and marriage can ruin a person, those expectations are reinforced by the Happy Ever After Moriarty gives her characters. A good read, but ultimately flawed. Share the post "And sorry I could not travel both and be one traveler"